Soup Queen and more- Welcome to my blog! My friends have been after me for a long time to do something like this, so I hope you enjoy it as much as I do. I love to make soups and it is now the fall when soups really taste good! 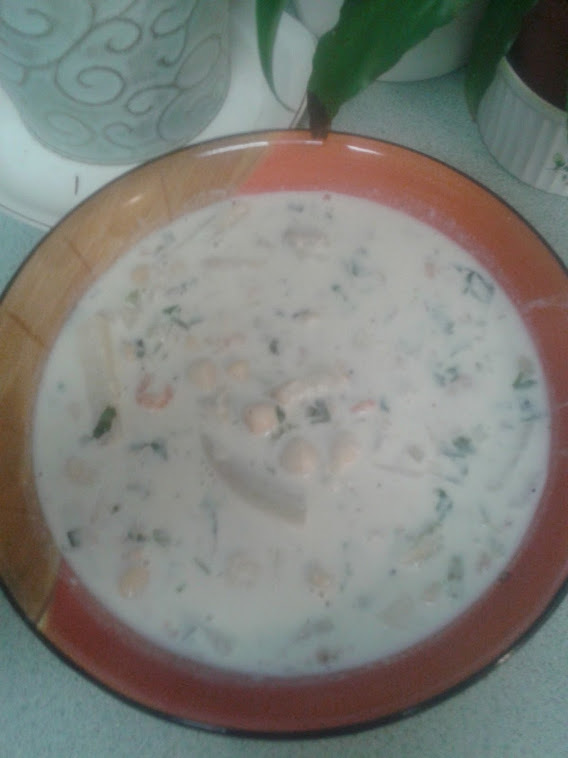 I have videos on 3 soups..Soup Queen-how to make chicken soup, Dump it in Bean soup and sausage and tortellini soups. Here is a link on YouTube for one- http://www.youtube.com/watch?v=lWMnkzkO5To&feature=relatedre. Meat, Cheese, Spinach a la my Nana-Anna Ordille Ortenzi. Nana's family came from Gesso, Messina, Sicily, Italy in the 1860's. My PopPop, Eugenio Ortenzi, emigrated from Canzano, Teramo , Abruzzi, Italy in 1914. Sicilians typically make a Cheese Ravioli. This is what my Great Grandmother, Concetta Giatto Ordille, made as her ravioli- A round ravioli. She used a cup/glass and cut round pieces of dough, 1 for the bottom and 1 for the top, add stuffing to center (2 tbs+/-), top with second round and fork it all the way around. My Nana made hers small and rectangular stuffed with a combo of meatm cheese and spinach. We think it was a combo of the Abruzzi/Sicilian raviolis. Here is how we make them. This is a video from Mario Batali on how to make dough. 3 cups flour 5 eggs. He used a fork and I use my fingers! He wrapped dough in plastic, I use a bowl. I do not refrigerate my dough. Once I have the dough ball ready, I put in on a lightly floured surface and cover with a bowl like my Nana did. Rest 20-30 min. I cut it in 1/2 then cut it into 1/4ths. Repeat with the other half once you are done with the first half.. You don't want to dry out your dough. Keep covered and take out 1 piece at a time. flour it and with your pasta machine, you are going to knead the dough. On the #1 setting, Working with the first piece (keep remaining pieces covered), flatten it into a rectangle shape. Starting with one of the shorter sides of the rectangle, feed it through the rollers. Lightly flour each side each time thru, folding it into it self making it a rectangle. Run thru on #1 5-6 times, making it a rectangle. Fork the edges to seal the dough pockets, using flour on the fork to keep from sticking. Be careful to not prick/gouge the dough or it will fall apart when cooked. OR Lay on a floured surface. I use kitchen towels laid out, flour the towels, then lay out the ravioli with out touching. Bring a big pot of water to brisk boil. Drop in 10-12 ravioli at a time. They will float to the top. Cook 5-6 min and taste one to see if dough is tender. Get a tray and ladle some spaghetti sauce on the bottom to lightly cover. Gently use a large slotted spoon and place on the sauce. Top with more sauce and Grated Parmesan. GRATE IT YOURSELF. DO NO BUY IT IN A BOX! I will haunt you if you do.! You can buy freshly grated parm from your deli. Friends asked me to remind them of the cooking tips I have shared. Always buy a block of good quality Parmesan or Romano cheese. store in a Ziploc bag. Never have dried out cheese again. Peel the skins off. Cut off the top. Cut the onion in one direction almost to the END. Turn the onion, cut at 90 degrees to form cross cuts. Turn on its side and cut across the cuts. Voila diced onions. Summers Harvest-one of our favorites to make when fresh tomatoes and cukes are in! Today I was bored and decided I wanted to make a new soup...so I looked in the cupboard and pulled out 4 variety of beans, elbow macaroni, Rotel tomatoes, tomato sauce. Next looked in the freezer, pulling out 12 oz sausage links, frozen green beans, peas, corn. Covered the ingredients with water. Cook on HI. At the 2-3 hour mark I added 2/3 cup elbow macaroni and a large handful of fresh spinach. Cook another hour. Add Salt and pepper again if needed. If you like it spicy, add hot sauce/cayenne etc the last hour and/or use hot Italian sausage. Serve topped with Parmesan and crusty Italian Bread. The flavors exploded in my mouth! Very pleased if I say so myself!! Have fun with this by altering the recipe to suit your tastes! I found this on Facebook and would love to give credit because it was DELISH! You won't be...lieve it's low carb!!! In a large bowl combine sour cream, mayo, 1/2 of crumbled bacon, 3 tbs chives, 1 cups of cheese,mushrooms and cauliflower and mix well... place in baking dish and cover with remaining 1 cup of cheese and rest of bacon crumbles. Bake for 15-20 minutes until cheese is melted. top with remaining 3 T chives and serve. My dear friend and former neighbor, Sue Clark made this as a birthday gift by request for me! We moved and my daughters make it for me every year! YOU will NOT be disappointed! Cream sugar and butter together. Add eggs 1 at a time, beating welll after each egg. Add flour, baking soda and sour cream. Mix well. Add extract. Mix. Pour into well greased bundt pan and bake at 350 degrees for 1 1/2 hours. cool slightly and remove from pan. When totally cooled, drizzle dark and white chocolate. Can add a caramel ganache drizzle as well. My Nana Ortenzi used to make this wonderful soup. So I made my version of it. OK Ortenzi /Ordille cousins...what do you think??? Is it right? Sauté meat in oil in large 10 quart pot until beef browns. Drain. Add onions, carrots, celery and tomatoes and simmer for about 10 minute. Drain and rinse beans and add to pot along with beef stock, oregano, Italian seasoning, pepper, Tabasco, sauce and pasta . Simmer until celery and carrots are tender, about 45 minutes. NOTES : Makes 10 quarts! Just cut the recipe down for smaller batches or FREEZE for later or SHARE with friends. Serve with crusty Italian bread and a salad! My roots are an Italian Mama and Pennsylvania Dutch Dad who was career Air Force. We lived in 7 states and Japan growing up. Dad's last duty sattion was the Pentagon and we moved to Camp Springs MD. I have been in the DC area ever since.I get my love of cooking from my Mom and Nana. I am blessed with 2 daughters and 3 granddaughters-all within 30 minutes! My goal in this blog is to show you how easy cooking is, share tips and recipes. 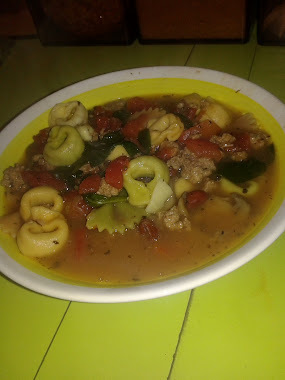 Catch my cooking videos...Soup Queen How to make CHICKEN Soup, Dump it in Bean Soup and Sausage and Tortellini Soup! Hope you take a minute to check out the ads on my site. Now, let's get cooking!